Doesn’t seem to matter where I go, David is always at work, using his Photoshop skills for the good of mankind. 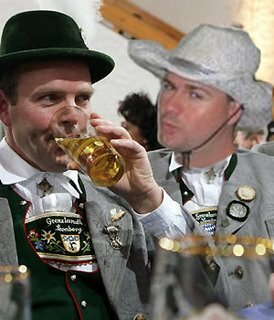 Whether it be me with 2 heads, or just enjoying a nice friendly chat with a guy dressed in traditional German clothing, you can count on David to offer up something special. Thanks again Dave!! Here it is!! Hey man!Great photo, I remember taking that photo of you at the German club in Brisbane 🙂 hehe. That was a great night.I miss being able to do stuff like this, Griffith’s work environment is definately unique, well, within the IT department anyway.Cool, you put a link to my blog, thanks! I didn’t even know I could put up links, I had never bothered. I will add yours to mine. Ok everyone, cya!David R.
Well, I checked how many people have viewed my profile and it has not gone up at all haha. I have about 30-40 people accessing mine that I know of… I don’t make it publicly visible to prevent blog spam, it’s quite terrible how much of it there is. I told everyone they don’t need to post comments, just to read it if they get time. I might make another blog, public, for another topic. So I might have a few blogs later on hey.